Aus-some: (From left) secretary general of FIABCI Asia Pacific Rusmin Lawin, president and CEO of SP Setia Bhd Group Tan Sri Liew Kee Sin, representative from the Public Housing Ministry of Indonesia Jiriel Komajas and head of SP Setia Jakarta office Loesja Imelda in Jakarta viewing a model of Fulton Lane, a project by SP Setia in Melbourne. JAKARTA: SP Setia Bhd has gone international, not just in terms of the locations of its projects, but also with the buyers it is hoping to attract. 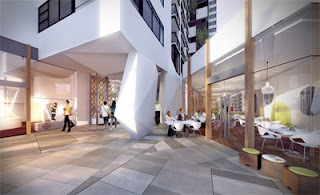 Armed with a portfolio of high-end developments in Kuala Lumpur and other places such as Australia and Singapore, the company is stepping up efforts to get the attention of property investors, particularly from Asia, who look for good buys beyond their home markets. A clear indication of this is the setting up of a representative office in Jakarta. Functioning as something of a marketing gallery, the office offers visitors information on SP Setia projects such as KL Eco City, an integrated development in Bangsar; Fulton Lane, two tower blocks of apartments in Melbourne; and the soon-to-be-launched 18 Woodsville, a luxury apartment building in Singapore. At the official opening of the office on Saturday, SP Setia president and chief executive officer Tan Sri Liew Kee Sin said property buyers were becoming increasingly global in their appetite for investments. The wealthy in Asian countries such as China, Indonesia and for that matter, Malaysia, have been snapping up properties in Australia, Singapore and London. “We must have the right projects for them to invest in. As we expand internationally, we're no longer looking at Malaysia as our only market,” he added. The developer was considering opening a representative office in London next. The aim of representative office in Jakarta, he added, was to showcase what SP Setia had been doing over the years in Malaysia and other parts of the world. However, it is not a sales outlet. Any sales transacted in Indonesia have to be done through authorised licensed agents. The alternative is for potential buyers from Indonesia to travel to the locations of the projects to see more for themselves before deciding. 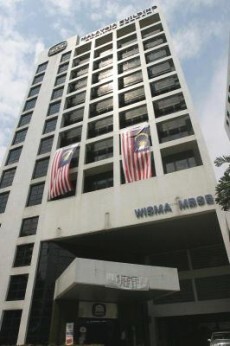 Liew said the office had received an encouraging number of enquiries and the company planned to move to larger premises. He added that another reason for having an office in Jakarta was to work on the long-term possibility of SP Setia investing in the Indonesian property sector. He pointed out that Indonesia is widely touted as the next big economy that everyone should invest in. “Like all business people, we are very keen to understand the Indonesian market. With the representative office here, we can spend time and effort and have people here to study the market,” he said. The idea is to be familar with trends and preferences of the Indonesian property buyers the average sizes of homes, the lifestyles of families, and the typical layouts, among other things. This begins with Jakarta, before the company can consider evaluating opportunities in other parts of the country. “We need to learn these specifics in order to do well in any country,” said Liew. He added that if SP Setia were to develop projects in Indonesia, it would focus on what it was good at, namely townships and integrated commercial developments featuring offices, shopping centres and condominiums. “The key issue in (venturing into property development in) any country in the world is land. If you go to London, Australia and Singapore, you can only buy small pieces of land sufficent only for an office or condominium block. Hopefully, we can do something bigger and more meaningful in Indonesia,” he said. He added that the company had been talking to some land-owners about possible joint ventures in Indonesia, but there were no firm plans yet. SIME Darby Property Bhd, which is the property arm of Sime Darby Bhd, plans to build the conglomerate's 11th township development north of its existing Denai Alam township in Selangor. Sime Darby Property head of property development Zulkifli Tahmali said the township is at its planning stage but will measure 404.8ha along the Guthrie Corridor Expressway, which also sites the Bukit Jelutong development. "The new township will be a mix of residential, commercial and industrial (development), but we have not finalised the gross development value yet," Zulkifli told reporters here last Thursday. He was updating reporters on Sime Darby's latest promotional property blitz under the Lifestylse Collection brand to sell its unsold properties located within the group's 10 townships. 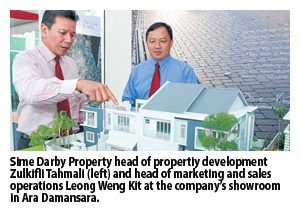 Sime Darby has developed townships called Ara Damansara, Planters Haven, Subang Jaya, USJ Heights, Bukit Jelutong, Putra Heights, Bandar Bukit Raja, Nilai Impian, Denai Alam and Taman Melawati. Meanwhile, Zulkifli said the month-long campaign, which ends at the end of this month, is being showcased at Oasis Square, Ara Damansara. Lifestyle Collection, which involves the largest range of product offering in a single property campaign by Sime Darby Property, offers 1,800 units of full-suite residential and commercial properties in and around Greater Kuala Lumpur. The landed and strata properties featured include top-selling newly-launched units as well as planned launches. They are located in 10 townships in the Klang Valley and Nilai, Negri Sembilan, where a 2,000-sq-ft residential unit's price starts at RM450,000. The company also plans to launch eight more properties with a gross sales value of RM1.2 billion, involving 1,800 units of residential, commercial and industrial property its by financial year ending June. "We are on track as we have sold RM1.2 billion worth of properties since the campaign started and we have another RM1.2 billion worth to sell until June. "It will be challenging but within our expectations," said Zulkifli. He said 90 per cent of its Putra Heights products had been sold. Good take-up rates were also recorded in Denai Alam (50 per cent), Nilai Impian (60 per cent) and Bandar Bukit Raja (70 per cent). Sime Darby Property contributes some 10 per cent to Sime Darby's revenue with the rest coming from plantations, as well as industrial, motors, energy and utilities and healthcare.